I spotted a sign hanging at my local butchers recently that proudly displayed the selection of local game that they were able to supply. All the usual suspects were there; mallard, pheasant, rabbit and pigeon. Then at the bottom of the list I saw that they were also able to get hold of haggis. This was quite reassuring because to be frank, the haggis problem around my neck of the woods is starting to get out of control. Just the other day, I had to chase a pair out of my garden with a rake, as they are fond of digging up bulbs and shrubs. Wee blighters are fast too. As I watched them zip off into the distance, with that horrible shriek they make, I knew they would be back soon enough. So I’ve invested in a large net and plan to lure them in with some cat food (they favour Whiskers) and before long, I will have my own steady supply of haggis to eat. Of course, haggises aren’t really these cute little woodland creatures that guilefully roam about the countryside. You know that and so do I. But I suspect for some, the idea of tucking into something that was once wild and free, sounds a lot more palatable than the prospect of slicing into a sheep’s stomach casing, stuffed with minced heart, liver and lungs, along with oats and spices. For that is what haggis truly is. 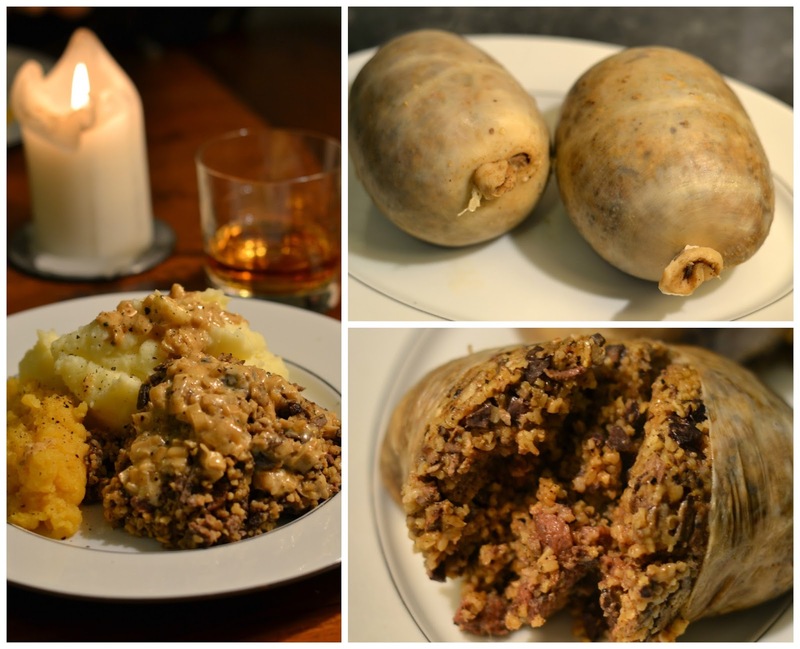 Now I love haggis and will gladly consume it throughout the year; without all the pomp and ceremony of having to toast and address it, and hauling the ol’ bagpipes out (in our house, it’s a pink recorder). But there is something nice about eating it specifically for Burns Night. A bit of drama and theatricality at the end of a dreary January, along with some whisky, always goes down well. Normally, I go out and simply buy one from the supermarket but this year, I decided that I would try and make one from scratch. As testimony to doing the whole nose to tail thing properly and in the spirit of adventure. So I got hold of a haggis kit from Sous Chef, an online emporium of culinary delights and unusual ingredients, and conducted a road test, to make sure I got everything right before next Monday. 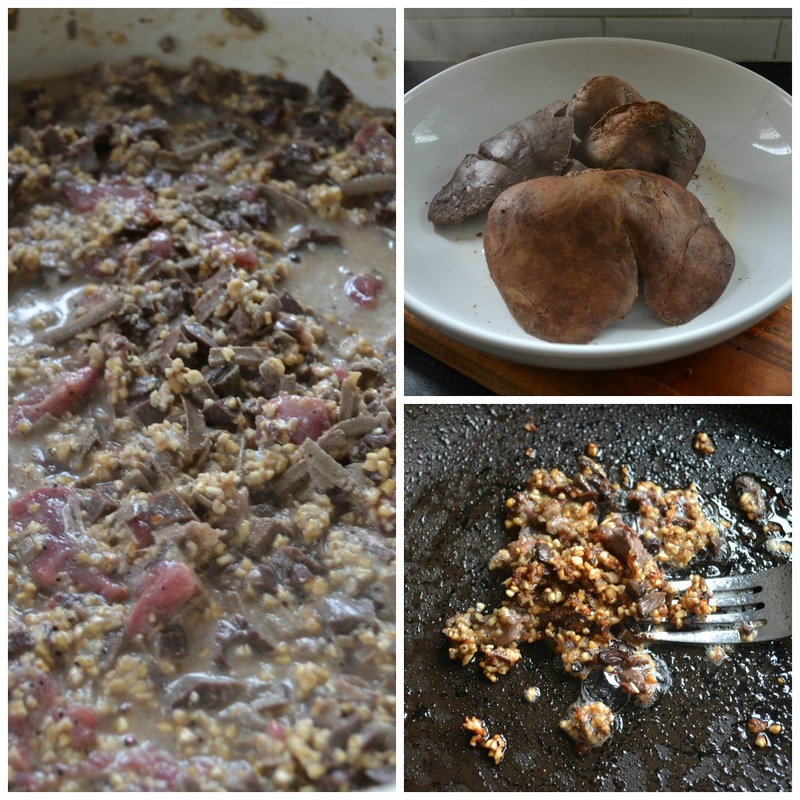 A slightly adjusted recipe that came with the kit will follow but first I thought I should offer a few observations, should you be considering making your very own haggis. And I really think you should. 1. Ordering pluck is a lot easier than you would expect. Pluck being the informal term for the collection of organs found inside a lamb. The heart, the liver and the lungs. I had a mild panic attack that I wouldn’t be able to get hold of some but after a couple of quick calls, I was reassured that my pluck would be available within a day or two. I got mine from TheGinger Pig. 2. When you finally get your hands on some pluck, it will test you and your capacity for the visceral nature of cooking. Everything will still be connected via a windpipe and the lungs in particular are challenging to handle. It was heartening though when my children came into the kitchen and asked what I was doing. As I explained with bloodied and shaky hands, they took it all in rather nonchalantly, before scratching their behinds and going back to the TV. 3. Handling the ox bung, the last metre of an ox’s intestine, is very challenging. It smells curiously of blue cheese and is quite slippery to handle after soaking. It also looks just a tad…wrong. But if generations and generations of hardy, tough and slightly psychotic Scots can deal with it, then so can you. 4. A little goes a long way. My wife saw me stuff the bung with practically the whole bowl of ingredients before suggesting that I was only catering for four. And she had a good point. I just wish she had said it sooner rather than later. But yes, smaller haggises are easier to handle and once the component oats begin to swell, you will soon have a lot of haggis to serve. 5. Last of all, if your haggis splits, all is not lost. I had two sat nicely poaching away in some simmering water and decided in my infinite wisdom to turn the heat up. A minute later, I glanced back into the pot to see bits of meat bouncing upon the surface. One had popped but after quickly fishing it out, wrapping it in foil and placing back in, the poor wee haggis didn’t suffer any real ill effect. In fact, the final result was fantastic. Having been able to control the seasoning at my end and add in a few flavours of my own, I would say (smugly) that a homemade effort tastes much better than any shop bought haggis. A fine fair proposition for your honest, sonsie face, to celebrate that great chieftain o’ the pudding-race! Rinse the whole pluck in cold water. Trim off any large pieces of fat and cut away the windpipe. Place in a good sized pot and cover with cold water. The lungs float, so keep submerged with a plate or a lid. Bring to the boil and skim the surface regularly. Gently simmer for 2 hours. Lift the meat from the pot with the tongs or a slotted spoon, and rinse in cold water to remove any scum. Place into a bowl and leave to cool. Strain cooking liquid through a fine sieve and put back on the stove to reduce until you have roughly 500-1000mls of stock. Leave to cool. Whilst the stock reduces, finely dice the cooked heart and lungs. Grate the liver using the coarse side of the grater. Finely dice the trimmings. Mix together in a large bowl, along with the suet, oatmeal and spices. Measure how much stock remains from cooking the pluck, and make up to 1l with cold water. When cool, add to the haggis mixture. To check the seasoning, pan fry 1 tbsp of the mixture for 2-3 minutes and taste. Add any extra salt, pepper or spice if needed. Spoon the haggis mixture into the soaked, rinsed ox bung. Be aware the filling swells as it cooks, so pack quite loosely, and keep a little bung at each end. When the haggis is the size required, expel any extra air, pinch, tie with string and cut with scissors. Tie the new end of the bung, and continue stuffing. Freeze any spare haggises. Before cooking, pierce the haggis several times with a needle. Place in a pan of cold water, and bring to the boil. Simmer for 1.5-2 hours. When ready, the internal temperature should read at least 74C. 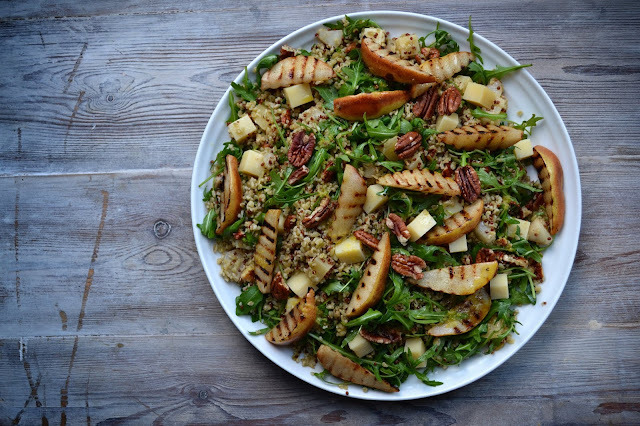 Serve with mashed potatoes and swede. Or neeps and tatties. And a whisky cream sauce. Recipe reproduced with kind permission of Sous Chef. Catherine Cutler - I do think most haggis recipes do a good job of masking the offal flavour, especially with all the pepper. And yes, you must give it a go.